I was amazed the first time I had a go at this chocolate pecan bars recipe. You can prepare them in minutes using whatever odds and ends of chocolate and nuts you happen to have, and you don’t even need a bowl. Magic! I tend to be a bit late to the party when it comes to Internet food sensations. I now know that these ‘magic bars’ (sometimes called no bowl bars or even 7 layer bars, even though I don’t see how they are actually 7 layers) have been ‘a thing’ both on and off line for years. 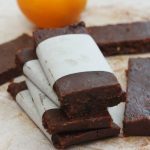 I only heard about them recently, however, when I spotted something similar to this chocolate pecan bars recipe both on Pioneer Woman’s cooking show and in a local food magazine. I think I’ve mentioned (probably more than once) that I’ve had to learn how to do everything one-handed since my son was born, as he will very seldom let me put him down! I think it must be a common problem for parents of infants. In fact I recently saw a billboard ad for a supermarket’s series of customer recipes. ‘Helen’s one-handed stir fry’ was splashed across the top of a picture of a smiling mother with a baby in one arm and a stir fry pan in the other. Yes, that’s about right, I thought to myself. I must hunt down that Helen’s stir fry recipe and make it this Helen’s recipe. Sounds just perfect! Now I must admit I didn’t have to resort to making these bars one-handed (Grandma to the rescue), but I truly believe you could do that if you wanted to. They’re that quick and easy. 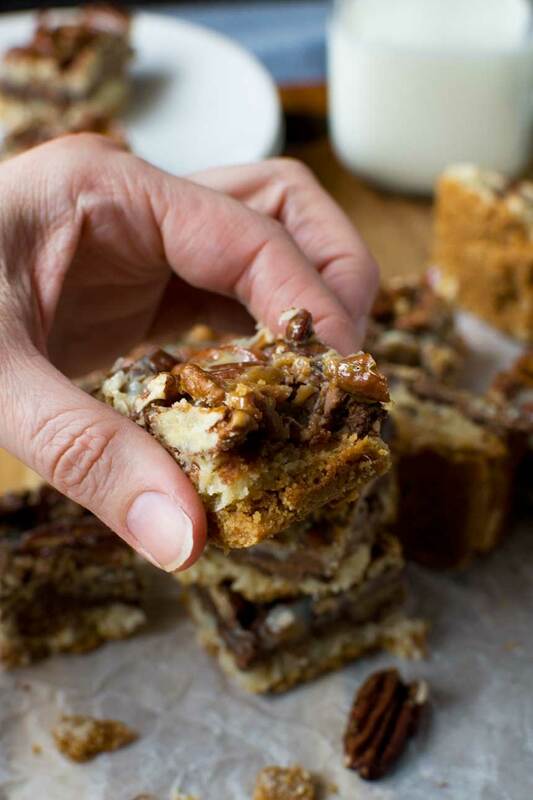 So… how do I make these 7 layer / ‘magic’ chocolate pecan bars? Pour melted butter into a square cake pan and press in Graham cracker (US!) or Digestive biscuit (UK and Oz!) crumbs. Sprinkle with cups of coconut, chocolate chips, and nuts. Pour a whole can of sweetened condensed milk over the top. Heck, two hands not really necessary. Half an hour later you have something deliciously sweet that’s pretty hard to describe. In fact I wasn’t sure what to make of these when I first tried them. But now I take a bite every time I go into the kitchen. Oops. 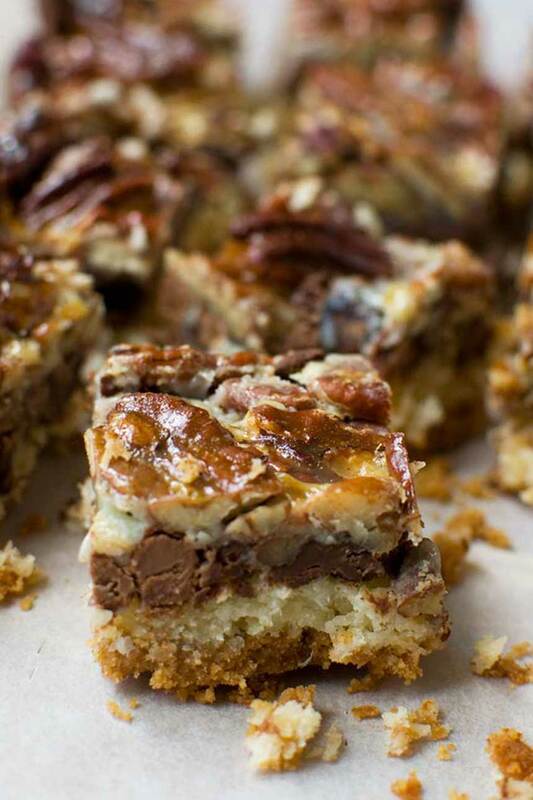 What do 7 layer bars / magic chocolate pecan bars taste like? Thought you’d never ask. They’ve got a cheesecake base topped with a sweet and chewy coconut layer that reminds me of what we used to called coconut macaroons. On top of that there’s chocolate and finally sticky, slightly crunchy pecans that makes me think of caramelised nuts, or even pecan pie. 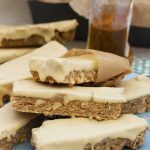 If you bake the bars for slightly longer, say 35 minutes instead of 30, you’ll find the condensed milk has started to turn into a chewy toffee. It’s delicious, and very addictive. 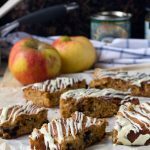 Maybe you’ve had something similar to this pecan bars recipe in your repertoire for years already, or maybe it’s totally new to you, like it was to me, but do give it a go with pecan nuts. 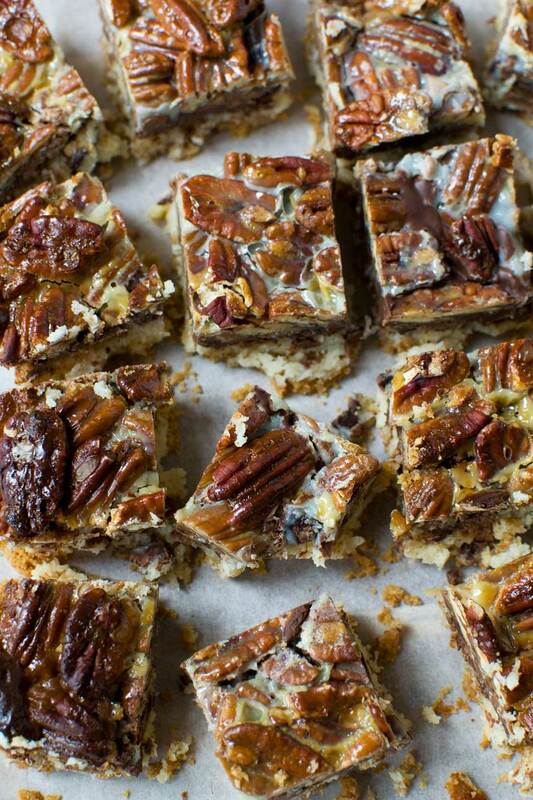 However busy you are, you can make these no bowl chocolate pecan bars! Cut them into small squares and you won’t have to feel guilty having 1 (or 5!) with your mid-morning coffee. 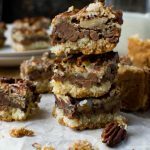 Really quick and easy chocolate pecan bars recipe with a Graham Cracker crust followed by layers of chewy coconut, chocolate and nuts. They taste like you've spent hours making them, but you can pretty much make them one-handed. No bowl required! Line a 9 inch square or equivalent baking pan with non-stick baking paper and preheat the oven to 350 F / 175C. Pour the butter into the bottom of the pan, then sprinkle over the crumbs. Mix around a bit with a metal spoon, then press evenly into the pan. Sprinkle over the coconut in an even(ish) layer, then sprinkle over the chocolate chips, followed by the nuts. Finally, pour over the condensed milk. Bake for 30 to 35 minutes, until the top is starting to go golden brown. Cool in the pan, then lift out and cut into small(ish) squares. Store in an airtight container. I like to make these with pecan nuts, but you could use any kind of unsalted nuts you like, or a mixture of many! These sorts of ‘magic’ bars are very versatile. The amounts don’t really need to be exact. Maybe you’ve got lots of chocolate chips but not so many nuts. No problem – why not add a few pretzels or mixed dried fruit instead? Addictive peanut butter Cheerio bars Greek Christmas honey cookies (melomakarona) Easter chocolate bark (with a video) Chocolate lollipops (homemade food gift with video) Chocolate-dipped Oreos (with a video!) 11 easy homemade chocolate gifts The easiest peanut butter cups in a jar (homemade food gift!) 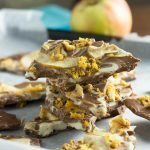 Toffee apple chocolate bark Eton Mess fridge cake Biscoff & white chocolate blondies ‘Hot cross bun’ truffles Chocolate stout cupcakes with peanut butter frosting Coconut & pistachio chocolate heart & star cookies FIVE last-minute chocolate gift ideas! I have visions of you with a toddler on your hips, making this with one hand!!! HELEN this is amazing! You know I love cheeky recipes like this. Sharing!!! Yup, that’s me… haha! I can do EVERYTHING one handed these days. I’m also getting pretty big arm muscles, which is the upside of all this! 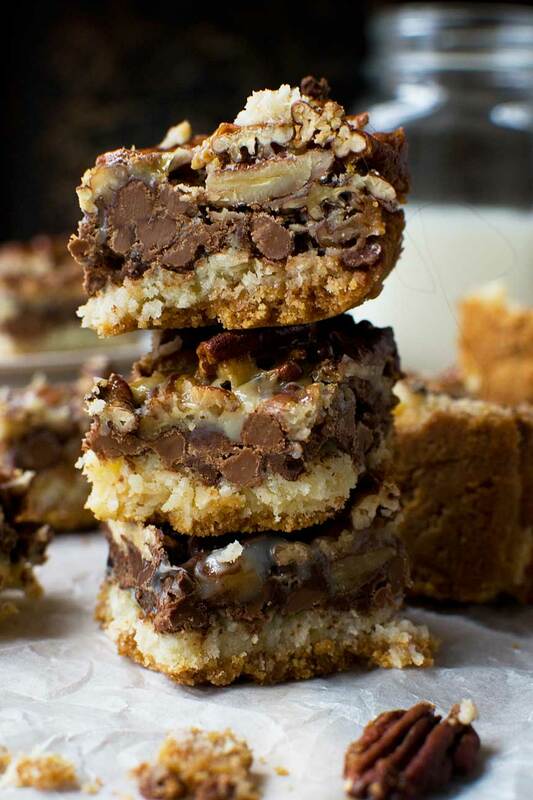 These bars have all my sweet tooth cravings all in one. I have to try these. Oooh, please do, Janette. You’ll get addicted to them tho, I warn you! These bars have it all going on and totally indulgent! Pinning! Holy Moly! These look SO GOOD! I’ll be making them tomorrow. I’ve never had no-bowl bars, but these look so delicious! Pinning to try them! Do try them, Mira.. you’ll never look back… lol! Tes videos sont superbes Hellen, la recette pareil encore plus simple à réaliser! Ces bars sont incroyablement tentants! ‘Magic’ seems like the perfect word to describe these, Helen. They look incredibly delicious! It’s so sweet that you have to do everything with one arm, lol! Sweet for the first 2 minutes. Then just tiring and tiresome… lol!